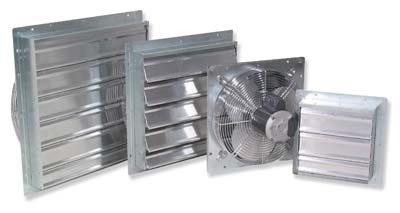 Florian offers these quality shuttter fans for your air circulation needs. Designed to last used in any applictions. With a number of features, water proof, powerful, quiet, and etc. Florian exhaust fans combine great performance, totally enclosed energy efficient motor, smooth operation. All housed in an aluminum tie bar shutter with an OSHA intake. Air de-stratification can help reduce heating and cooling bills by up to 25%. Remove and control unwanted condensation. Eliminate heat build-up inside your Greenhouse. Unbelievable smooth and quiet operation. Comes totally assembled out of the box. horsepower to deliver maximum efficiency. Chrome grill allows for easy cleaning and meets OSHA guidelines. Most economical 3 speed fan on the market. High efficiency aluminum shutters with tie bar to eliminate shutter flapping and opening on windy days. Extremely energy efficient, totally enclosed, maintenance free, direct drive high efficiency motors have completely sealed ball bearings, UL and ULC certification, built in automatic thermal overload protection, covered by afull two year warranty.